The following special vendors support the Landmarks Society through their membership. They are our partners in keeping our history alive. We gratefully acknowledge their contribution to our success and ask that you support them as well! Dov Sims, California Rose Catering, Inc.
California Rose Catering is a Berkeley-based, family-owned company that specializes in fine food and start-to-finish event design. Executive Chef Dov Sims states, “Good food is the centerpiece of all our events!” His flare for unique comfort food is nothing short of impressive and he seamlessly combines the traditional flavors of Latin America and Asia, but most notably, he delivers a culinary experience that will suit your style, your expectation and your palette. For over 28 years, CaterMarin has delighted clients with delicious food, stylishly presented. Terry and Cindy work very closely with every couple to understand their expectations and desires. As one bride said, “CaterMarin is the solution to a memorable wedding.” They do the worrying, and succeed in letting you be a guest at your own event! Terry and Cindy have decades of combined catering experience and they still love weddings. Rated in the top 10 by the San Francisco Chronicle and #1 in the Best of Marin Pacific Sun. Founded in 1975, Delicious! Catering combines years of experience with up-to-date menus. Certified as a Green Business, our emphasis is on locally grown products, and we use organic products whenever possible. When you call to begin your planning, one of our event planners will prepare a proposal for you. We then invite you to come in for some tasting, and we further discuss your vision for your day. You can bring a friend or Mom along to the meeting if you like, so they can share the fun. During the event, we work with your other vendors to make sure everything runs smoothly, so that you can enjoy your day. All Seasons Catering is a premier, full service catering company that has been serving Marin County and the Bay Area for over 20 years. From picnics to elegant feasts, wine county events, memorable weddings, and corporate galas, we take pride in providing the best full service catering possible! Our individually designed and exquisitely prepared menus are of the highest quality. Our trend setting, creatively inspired atmosphere and decor are unique to the industry. Sage is a thoughtful & artful full-service catering company. Based in San Rafael, California for the past 17 years we serve individuals and businesses at the finest facilities throughout Marin, Wine Country, San Francisco & the Greater Bay Area. We offer full service catering for business and social events. At Sage Catering we are committed to the following principles: the finest quality food, impeccable service, professionalism & attention to detail. Robin Scott has a deep, personal appreciation for food and for bringing people together to enjoy it. 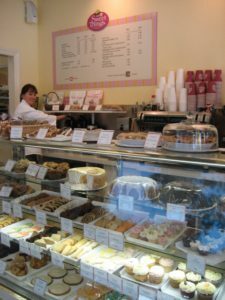 She is well known and beloved in Marin County as a tried and truly caring caterer. Whether your event is a casual luncheon for best friends, an English Tea, a black-tie wedding or a themed party, Robin Scott Catering will make the occasion festive, memorable and unique, designing a superb guest experience. Robin delights in creating imaginative, customized menus and in preparing delicious foods, beautifully presented, with good wines and superior service. Catering is only part of Robin’s talent. She is a persnickety shopper of homegrown and local ingredients, even growing her own apples, figs, raspberries, herbs and lemons. What makes Robin’s events unparalleled is her commitment to detail and personal service to assure that each event runs smoothly from start to finish. After attending Tante Marie’s Cooking School in San Francisco, she previously a chef for, among others, Insalata’s, Perry’s, and the Pacific Spirit before opening Robin Scott Catering. Taste Catering has provided the very best in catering and event planning services for private and corporate clients in the San Francisco Bay Area for almost 30 years. Each and every employee at Taste is dedicated to excellence in the products served and the services provided. Taste uses only the freshest and highest quality ingredients and actively supports local growers and producers that engage in organic and sustainable agricultural practices. Taste is committed to making each event unique and the best our clients and their guests have ever attended. AWC has been catering in the Bay Area for over 35 years where we have been receiving raves from our clients on both our food and our service. We can help you with all aspects of your reception: food, staff, rentals, flowers, photographer, music, party favors, design and any other details where you want us to be involved. We will do as much or as little as you like. Ann Walker has written several cookbooks, writes nationally and internationally on food and wine and teaches cooking and wines classes. This gives us a broad base to please your palate and match your style and taste. Please call and we will send you a sample menu that will give you an idea of some of things we offer and of the pricing. We’d like you to taste our food and, together, we can work out a menu just for you. Featuring elevated comfort cuisine paired with Northern California’s freshest cuisine and coastal influences, this resident public house will tempt you with its farm-to-table dining approach and excite you with its chic gastro pub vibe. Jamie Prouten joined The Lodge at Tiburon in 2011 as Executive Chef of the Tiburon Tavern. Recognizing his love for the restaurant industry at a young age, Prouten brings more than 15 years of culinary experience and knowledge to the table, having most recently helmed the kitchen of Rotisserie & Wine, part of the well-known Tyler Florence Group, in Napa. His passion for food paired with his adventurous nature in the kitchen goes hand-in-hand with the fresh sensory experiences synonymous with The Lodge. 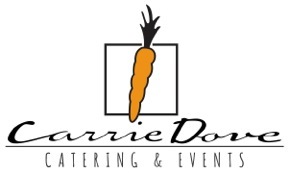 Carrie Dove Catering & Events is a full-service caterer, producing perfect events throughout the Bay Area. We pride ourselves on producing “comfortably elegant” events that are unique to each of our clients. We have worked hard to build a team of talented chefs, and creative event specialists, captains and wait staff. Our team shares many important traits including: charisma, humor and discretion. When it comes to professionalism and service, our standards are exceedingly high. We promise that we’ll return your phone calls and emails quickly, we’ll make the process enjoyable, and we’ll put on a perfect event! The mindset of Fork & Spoon revolves around more than just artisan cuisine and a custom catering experience. Every aspect of a Fork & Spoon event is thoughtful and purposeful. Every ingredient in every artisan dish has meaning and significance to the people to whom it is served. Every meal (from preparation to plating) tells a story. Fork & Spoon is artisan catering with passion, modesty and poise. Together, that’s what we call effortless entertaining. Our goal at Just Relish is for you to sit back and RELISH the time with your friends, RELISH the good flavors & RELISH the memory of the event as a whole. We create and produce events that provide unique catered food with and International Touch, individualized to meet your personal style. Poppy’s Petalworks is known for its refreshingly unique and chic style that’s “outside of the box.” From classic elegant weddings to simple modern events, we are committed to offering each client an exceptional petal experience on their special day. Annabella Eriksson and her husband Lars bought Mill Valley Flowers in 1990. After 20 years as a nurse, Annabella decided to follow her passion and do what she truly loved. She has been making beautiful bouquets for her lovely clients for the past 23 years with the help of her trusted team of designers. Specializing in weddings and events, Annabella has done it all over the years. Next time you are in downtown Mill Valley stop in and say hi. Soulflower Floral Design offers custom floral and event design for business and residential settings, special events and weddings. Dedicated to sophisticated, eco-elegant design and impeccable attention to detail, Soulflower translates each individual client’s style and aesthetic into works of floral artistry. Integrating color, texture and unique vessels with lighting, furnishings and decor elements, Soulflower will transform your event into an unforgettable experience. 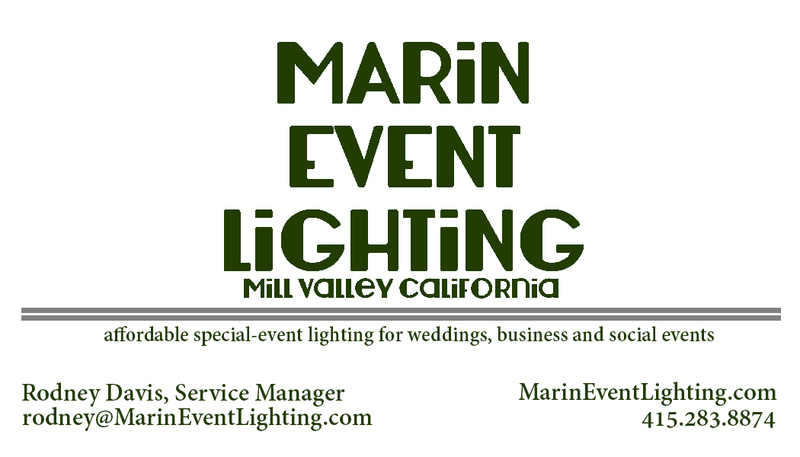 Special event lighting for weddings, business and social events. Patio Heaters, Umbrella Lights, Up Lighting, String Market Lights, Paper Lanterns, Luminaries, GOBOs. 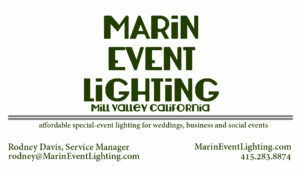 All are available from Marin Event Lighting. From intimate gatherings and elegant weddings, to large gala events, GOT LIGHT? offers the finest service and designs in the Bay Area. Whether it’s providing a soft ambient glow to a room, or simply accenting a floral centerpiece, lighting can profoundly transform your upcoming special event, corporate event, or wedding. But we’ve got more than just light at GOT LIGHT? We also specialize in a wide array of draping, audio, video, staging, and much much more! We are passionate about design and are obsessed with the details ― all of course while keeping a focused eye on the big picture. All that glitters is 22K gold in the China Cabin. Designated in 1978 as a national maritime treasure, the China Cabin was restored to its former splendor as a Victorian drawing room. Visitors are enchanted with the ornate and regal decor of the interior. The walls and arched ceiling have been painted a crisp white and highlighted with gold leaf. Along the sides of the Cabin are a series of small, beautifully etched glass windows; elegant crystal chandeliers illuminate the room. The Cabin also has a deck with wonderful views of the San Francisco skyline, Corinthian Island and the nearby yacht harbor. The China Cabin offers a rich and sophisticated setting for your rehearsal dinner, Marin wedding or reception. The Landmarks Art and Garden Center, a lovingly renovated historic cottage and garden from Tiburon’s earliest years, offers a unique setting for outdoor garden weddings and special events. The square-acre site, with dramatic views of Richardson Bay, is a garden composed of large flat lawn and four terraces joined by curving brick walkways. Throughout the garden are benches, each offering a special view of the bay and surrounding hills The landscape features heritage trees, a rose arbor, colorful floral beds and a pagoda birdhouse. Nestled in the garden is the restored farm house, built in the 1870s when Tiburon was a bustling railroad terminal. The gray shingle clad cottage features two sun-filled rooms, highlighted by an original wood burning stove. Just outside is an 1890 fire-school bell that is rung for celebrations. This is just another one of the unique touches that contribute to the site’s historic charm. A Marin Premiere Outdoor Wedding Site. Across the spectacular San Francisco Bay, The Lodge at Tiburon is a simple, sublime escape from the bustle of the city. Only steps away from the ferry docks, The Lodge is a quaint retreat nestled among the cafés, boutiques and galleries of Tiburon and is adorned with relaxing décor and an inviting ambiance. This hidden retreat offers quintessential Northern California experience at its best. The Lodge at Tiburon features 103 warm and cozy guest rooms and spacious suites – most with private balconies or patios and all with courtyard or mountain views, graced with our local San Francisco charm. Michelle is a professional harpist performing in the Bay Area since 1977. She performed for the King and Queen of Thailand, Prince Alexander and Princess Katherine of Serbia, President Jimmy Carter, Francis Ford Coppola, and quarterback Steve Young, to name a few. She toured with Frank Sinatra, Sr., and Linda Ronstadt, appearing on The Tonight Show and Good Morning America. For weddings and private events, Michelle often uses her concert harp, depicted in the accompanying picture, which has its own internal sound system. This enables her harp to be heard regardless of wind or other ambient sound. Please call or email with any questions! I have been conducting weddings for many years and love doing so. 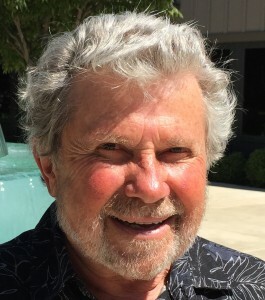 I am retired from the Parish ministry (Sausalito Presbyterian for nearly 27 years) and currently active with weddings, memorial services, writing and speaking. Our initial meeting can take place at my home in Mill Valley, or via Skype, FaceTime or phone. 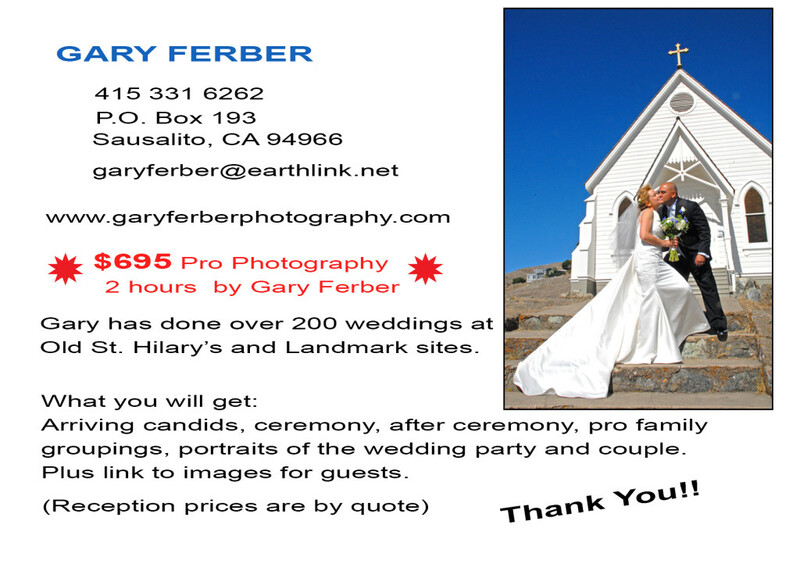 I’ll email you 6 sample ceremonies. They are only a place to begin; you do not need to use them. You have 100% editorial control over every word spoken during the ceremony. I offer a 1 hour, free seminar titled: Mastering The Marital Arts. The seminar is conducted via Skype or at my home. It is about creating and maintaining a healthy relationship that will last lifetime. My wife and I use these principles daily; we’ve been happily married for 33 years. I have been providing couples and families with; secular, non-religious, religious, spiritual, interfaith and non-denominational ceremonies at The Landmark Society venues for over 10 years. Ceremonies can be uniquely personalized. Assistant Chaplain Good Hospital in Santa Clara. Lay Eucharist Minister Episcopalian Church of St. John’s. Benedictine Camaldolese Oblate New Camaldoli Hermitage. Rev. Ema Drouillard has a very reassuring presence and that is big when nervous tensions are sky high. She is mature and stable, a vitally important characteristic of the best officiant’s since they do not need to draw attention to themselves. Ema is very knowledgeable of wedding day dynamics and has a good sense for disarming fears and instilling confidence, something of a gentle commander who doesn’t get ruffled. One prominent Bay area photographer considers “her one of the top five officiant’s” in the area. Just minutes away and within sight of Old Saint Hilary’s Landmark. A convenient shuttle pick-up and drop-off location. Competitive price and simple process for bridal parties who wish to pay for their guests’ parking. Capacity: 50 cars in an exclusive lot with additional space in an adjacent, overflow lot. Reservations: call Roger at Zelinsky Parking LLC, Tiburon, 415-435-1008. Offering linens, equipment and everything else you need for your party setup! Local Marin company! Life calls for celebration and A PARTY CENTER is dedicated to helping you celebrate your most memorable events. Whatever the occasion may be: a joyous wedding, your child’s birthday, a corporate event, or a family gathering, we are here to help. Since 1968, A PARTY CENTER has provided our clients with outstanding customer service. Each of our rental consultants is committed to making your event an exciting and unique occasion. Great care is given to the selection and quality of our rental equipment, so that it can be used with pride. We warehouse a large assortment of table linens, party tents and canopies, tables and chairs, china and glassware, and wedding goods. For the finishing touches we also carry party supplies; from “green” biodegradable and compostable plates, cups and flatware, to exquisitely designed and printed paper products. We are centered in the heart of Marin and take great pride in being a locally owned business. Our reputation for dependability, our quality equipment, and our knowledge and expertise, are why you can count on A PARTY CENTER. Buy Local. Guaranteed to provide fun and entertainment for your guests. A PopUp Studio is an open-air, interactive “photo booth” that offers photo strips and prints at your event. To see samples and read testimonials, please visit our website http://www.apopupstudio.com/. For news and specials click on our Facebook link > https://www.facebook.com/pages/A-PopUp-Studio/131263116944079 Thanks. Jere Visalli has been a wedding and portrait photographer in the SF Bay Area for over 20 years. His work is a blend of dynamic, spontaneous and emotional images combined with thorough coverage of the family and guests. Prices are very reasonable and flexible, accommodating any size event. Love, laughter, glances and giggles. Beautiful moments, captured quietly. Kathryn MacDonald Photography specializes in capturing the spontaneity of your big day. With over a decade’s experience, Kathryn uses refined, classic wedding portraiture and photojournalism to expertly photograph your event from start to finish – gently guiding your party to keep them relaxed and allowing your day to play out naturally. Lisa Feldman Event Planning & Design has a passion for personal, meaningful & creative celebrations. Lisa and her team provide a range of highly individualized services for many different types of events including weddings and milestone birthday celebrations. Lisa has been a Tiburon resident for 20 years and has planned many events at the LAGC. She is a great resource for local services for all aspects of an event, from the invitations to the last dance (including accommodations, catering, transportation, entertainment, etc.). Lisa is also available to serve as the on-site coordinator for the day of an event. A Savvy Event is an event planning and designing company located in Wine Country. Kelly McLeskey-Dolata started A Savvy Event in 2007 because she has always had a love for all things beautiful, fun, unique, creative and detailed. 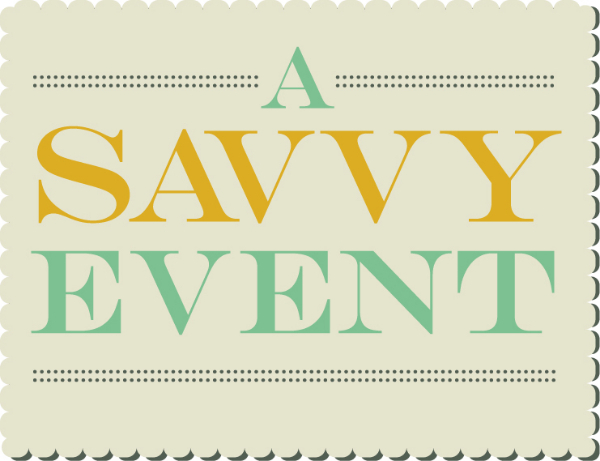 A Savvy Event does all types of events in and around the bay area. On the weekends and even weekdays we are planning and designing weddings, birthday parties, showers, anniversaries and just about every milestone event you can think of! Life should be celebrated and that is what we do! For over thirty years, Parties, Parties, Parties has provided full service special event and wedding planning in San Francisco Bay Area. Parties, Parties, Parties is passionate and excited about creating and coordinating beautiful and memorable special events for our clients. Our primary goal is to provide innovative experiences and comprehensive event planning services as a full scale event planning company. Our pledge is to act as a valuable resource for planning and a responsible partner with the event in progress. We value and are honored to have many repeat clients and to establish long-term relationships. Our thirty plus year relationship with The Hamlin School is a great source of pride. Our coordinating services bring in revenue to the school and acts as a fund-raiser. Branching Out Cakes is a specialty cake company dedicated to creating the highest quality wedding cakes. Pastry chefs Jill Branch and Anna Saki have created wedding cakes to order and still love what they do. We personally deliver and set up your cake anywhere in Marin County. Branching Out Cakes will create your dream wedding cake! Christian Röder, owner of Krumbs Cakes, has been astounding people all over the world for 27 years with his inspirational culinary aptitude. His creativity, attention to detail, and personalized service will make your occasion a dream come true .Mouthwatering, moist and bursting with flavor, our cakes are made fresh with the finest ingredients. It’s quality you can taste in every bite. Please contact Krumbs Cakes with any questions or if you would like to schedule a tasting and consulting appointment.